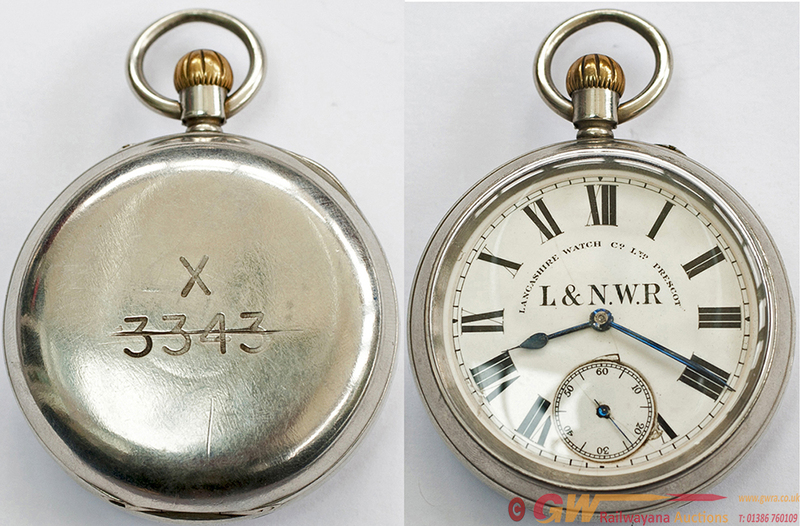 LNWR Pocket Watch, by Lancashire Watch Co Ltd Prescot. A good quality English made watch with top wind and lever set for time adjustment and supplied with 4 pairs of extra jewels. The dial is free from chips and has LNWR enamelled below the XII position as well as the maker's name. The good quality Nickel case has matching numbers 414 to all parts and the back of the case has the number 7777 and also 3343 machine engraved and crossed out, the numbered movement 219829 is fully signed Lancashire Watch Co Ltd Prescot & London, the LNWR were invoiced for this watch on 21st November 1899 and purchased 80 of this type. In good clean working condition.